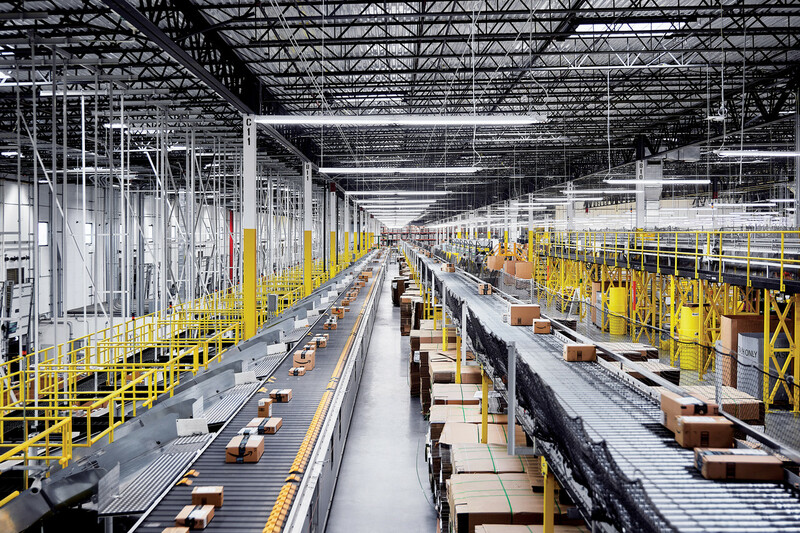 This Amazon distribution center in Baltimore can fulfill a million orders in a day. It may not need humans for long. What if your company could store and deliver goods as easily as data? Amazon, Walmart and others are using AI and robotics to transform everything from appliance shopping to grocery delivery. “Welcome to the physical cloud,” writes The Wall Street Journal (Oct. 15, 2018). Take, as an example, Amazon’s one-million-square-foot distribution center in Baltimore. Its scaffolding and seemingly endless conveyor belts disappear at a vanishing point within the building. The machine is a dazzling combination of chutes, ladders, rollers and 11 miles’ worth of conveyor belts. Customers’ orders move from shelving into bins and from bins into boxes as they travel via the machine straight into delivery vans, passing by stationary workers at various points along the way. Humans are rarely required to move around here. It’s much faster, and cheaper, to have stuff brought to them. This is where robots come in. Kiva robots can carry up to 750 pounds of goods in their 40-odd cubbies. After a customer places an order, a robot carrying the desired item scoots over to a worker, who reads on a screen what item to pick and what cubby it’s located in, scans a bar code and places the item in a bright-yellow bin that travels by conveyor belt to a packing station. AI suggests an appropriate box size; a worker places the item in the box, which a robot tapes shut and, after applying a shipping label, sends on its way. Humans are needed mostly for grasping and placing, tasks that robots haven’t mastered yet. Amazon’s robots signal a sea change in how the things we buy will be aggregated, stored and delivered. The company requires 1 minute of human labor to get a package onto a truck, but that number is headed to zero. Autonomous warehouses will merge with autonomous manufacturing and delivery to form a fully automated supply chain. How does this latest Amazon facility differ from the one we describe in the Global Company Profile that opens Chapter 12? How is AI being used in this warehouse?